The indisputable kings of the hot wing, Fire on the Mountain has been serving its famous fried chicken since 2005. Not only does it offer the city’s tastiest Buffalo sauce, but it also has the spiciest, and if you’re feeling adventurous, there's a roster of 12 homemade sauces ranging from Jamaican jerk to a raspberry habanero. And if you’re feeling like a beer well, there's that too! 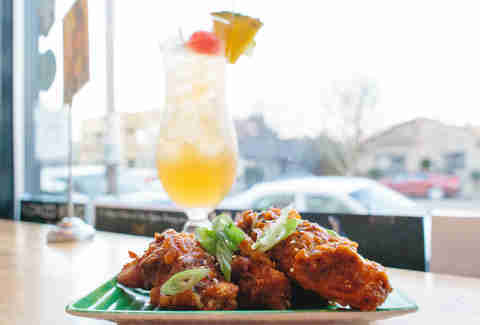 Who would have thought that a little Hawaiian spot would be serving super-sweet Korean-style chicken wings? Sure, you can get them with your plate lunch, but the best time is happy hour when they’re five for $5. 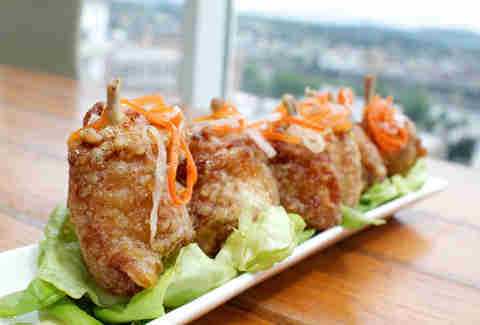 These crispy delights come coated in a mildly sweet and spicy sauce and are topped with fresh scallion. Add two scoops of mac salad for $2 and a dangerously boozy Mai Tai for $5 and dream of palm trees. A little, okay a LOT, off the beaten path, you’re forgiven for not knowing about this unknown Chinese restaurant in the no man’s land between Portland and Gresham. But if you do find yourself driving those lonely streets, we highly recommend stopping in (or even better, ordering to go) for the mandarin chicken. 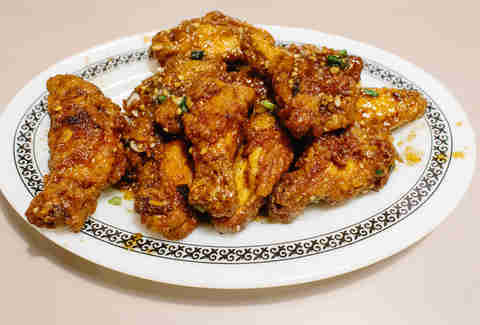 They might not sound special, but these wings are nothing like the mandarin chicken bits you get at Panda Express. Top Chef runner-up Gregory Gourdet runs the kitchen at one of our favorite places to catch the sunset and offers modern Asian cuisine at Downtown’s only rooftop bar. So what does a modern take on the chicken wing look like? Delicately Frenched, fried, and glazed in a sweet chili sauce, these wings are like meat lollipops. 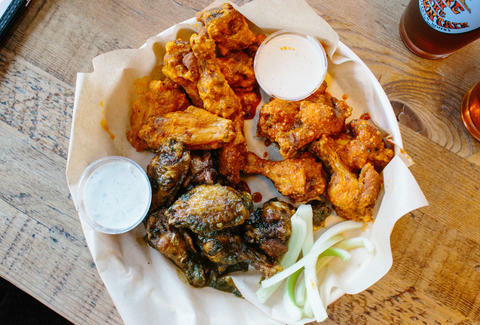 There are now four Andy Ricker joints serving his signature wings in Portland. The original Pok Pok on Division; its “waiting room” across the street, Whiskey Soda Lounge; a Thai drinking establishment near NoPo, Pok Pok Noi; and now Pok Pok Wing in the airport. 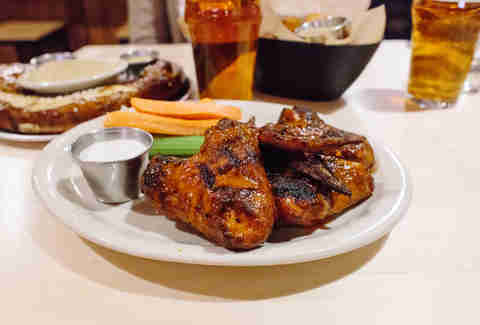 With openings in both NYC and LA in the past two years, it’s fair to say these wings are the most famous food to come out of Portland. And why not? 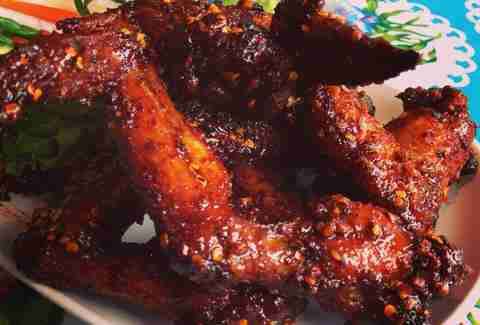 These crispy wings are covered in a sweet and funky fish-sauce glaze that you can get either mild or spicy. 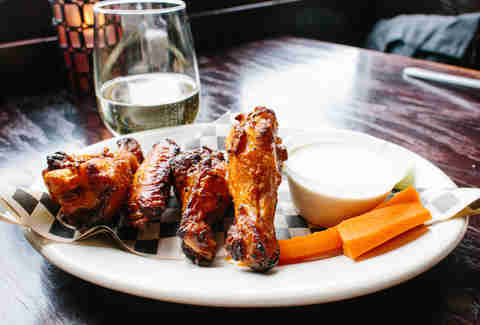 This bar’s main attraction separates itself from other classic Buffalo wings by smoking its wings before frying them. The depth of flavor is a welcome addition, as is the house-made hot sauce that almost gives Fire on the Mountain a run for its money. The best part is combining happy hour (five wings for $5) with “Wing Wednesday,” netting you 10 wings for the same price. One of the other spots to remain in our good graces, this little corner market puts out no nonsense wings (and jojos, if you’re so inclined) that don’t require any special smoking, seasoning, or saucing. Breaded with a hint of spice and touch of salt, eat them piping hot straight out of the bag. 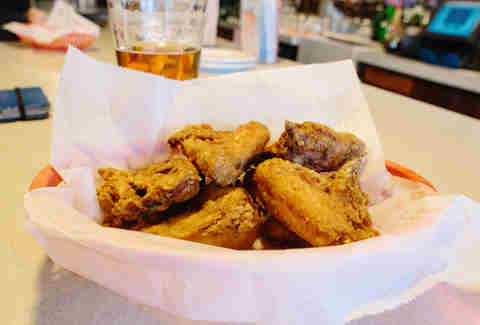 Oh, and it doesn’t hurt that at three wings for $2.50, these are the cheapest on our list. You’ve probably seen the red sign hanging from what appears to be a dilapidated house on an unassuming corner of NE Glisan. Oregon Lottery and Keno banners adorn the outside of a building that houses not only Chicken Little, but also the Hour Glass Pub, an unnoticeable dive bar except for the fantastic frying going on in the next room. 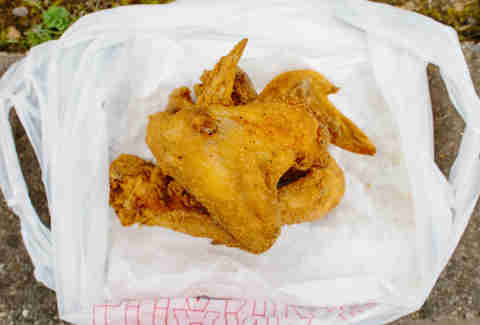 You can order a whole bird or by the piece, and at $1.50 a piece for wings, that's definitely the way to go. Once a food cart famous for down-home vittles, CQ now a real restaurant famous for... um, the same thing! 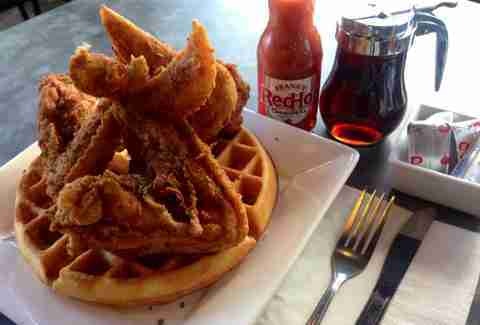 We’ll admit it’s almost cheating to put Crown Q’s wings on this list because they come with a waffle, but then again, everything should. Add a little of the homemade BBQ sauce and you’ve got one of the best dishes on Killingsworth. One of our favorite new spots in the Pearl not only brews a decent beer (despite being a midwest transplant), but it also manages a decent lineup of bar food that, considering the portion size, is a pretty sweet deal. A common phrase on the menu is, “These bad boys are huge!” And when it comes to the wings, that's no lie. Our suggestion, go for happy hour when you can get three wings for $6.